Real ramen — not the factory-produced product with instant noodles and a powdered flavoring packet, but fresh noodles and painstakingly prepared, flavorful broth — inspires strong feelings. 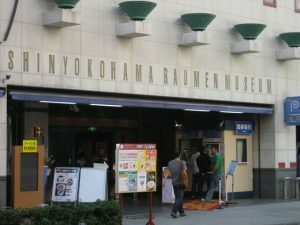 It’s inspired two movies, the cult favorite Tampopo (which I found nearly unwatchable when I last viewed it) and the poorly written and overacted The Ramen Girl (2008), and at least one museum, the Shinyokohama Raumen Museum in Yokohama, Japan. While in the southern part of the Tokyo area last month (Kawasaki), my family had one day that could be devoted to tourism, and because of our curiosity about a noodle-focused museum and the museum’s geographical convenience, we picked the ramen museum as our destination. Getting there was the first challenge. It was simple enough — only two train transfers, one within the Odakyu system and one to the Japan Rail (JR) Yokohama line, and then a short ride to the Shin-Yokohama station. Fortunately, enough train station signs are in English that it’s possible to find your way through the train station mazes without knowing Japanese (but writing down the Kanji — the complicated Chinese characters that make up part of the Japanese writing system — for Yokohama and Shin-Yoohama might be a good idea because some of the maps that show fares — like this one at the Kita-Kamakura station — are only in Kanji). The highlight for us was the basement, where the museum has created a 1958 Tokyo streetscape — 1958 marking the year of the introduction of instant noodles in Japan — complete with architectural details and movie advertisements from the era. 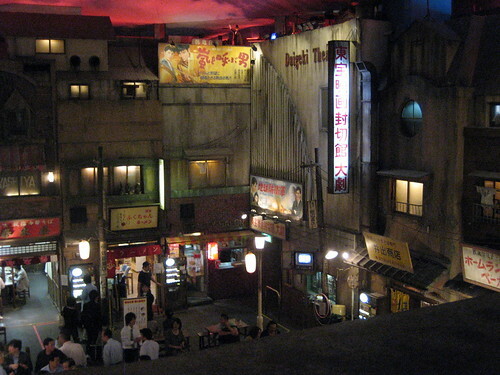 Around the two-story reconstruction are nine small ramen shops, a smoking room, a few more gift shops, and a drink stall or two. The nine shops were chosen by the museum because of their quality and also to provide geographical diversity — ramen from Hokkaido differs from Tokyo-area ramen, which differs from Kyushu, and so on (a page at the ramen museum’s website explains the offerings). 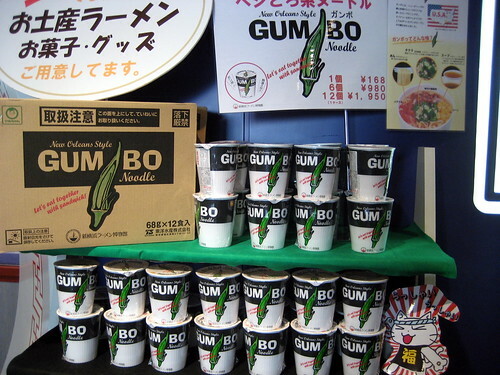 After making our decisions — my sister and I went to the Hokkaido shop on someone’s recommendation and my parents went to another shop — and re-reading the directive that “each person must order at least one bowl of noodles,” we placed our order at a vending machine outside the restaurant, and waited in line for a few minutes. (Using vending machines for food ordering is fairly common in Japan, as it eliminates the need for restaurant staff to handle money. For the non-Japanese-speaking tourist, it offers the additional benefit of reducing the language barrier.) When we were seated, we gave the ticket from the vending machine to our server and within a few minutes, our two bowls of steaming noodles had arrived. We tried their soy-laced and miso-laced versions of the basic noodles, and agreed that the miso broth was much more interesting. Both were delicious, with wonderful noodles, if a bit salty*. The “each person must order a bowl of noodles” rule is understandable, but makes it difficult to do much sampling. In recent years, therefore, the ramen shops have been offering half portions (priced at ¥550 vs. ¥800-1000 for the full size). A good idea, but we found that even the half size was more than half a meal, and didn’t end up visiting another restaurant. It would be nice if they had even smaller bowls to allow more tasting. Despite the flaws, the ramen museum is definitely worth a visit if you’re in the Tokyo/Yokohama area. The detailed recreation of 1950s Tokyo, the unusual merchandise in the gift shop, and the distinctive ramen offerings make for a fun afternoon or evening (the museum is open until 11 PM, with last orders around 10 PM). * The soup broths in all of the shops are made using various meat products (pork, chicken, and/or fish), so strict vegetarians are left out of ramen sampling here.